My WoW’s for this week are Collide by Melissa West which is the third book in The Taking series & Ensnared by A.G Howard, the third book in the Splintered series. Nice! I always love West's covers! Haven't read the books though! Need to start Howard's series as I have the first two in my TBR mountain! One day! Great choices this week. I need to catch up on Melissa West's series. I haven't started either series but I hear they're great. Cool picks! I'm really excited to read Collide as well, Sharon. I'm hoping everything wraps up nicely. I haven't read Splintered yet, but I need to from all these great reviews. These are great picks! I want to Ensnared so badly! So excited for both of these! :) Great Picks! I really need to get my act together and get started on both of these series!! That cover of Ensnared could quite possibly be my favourite in the series so far!! 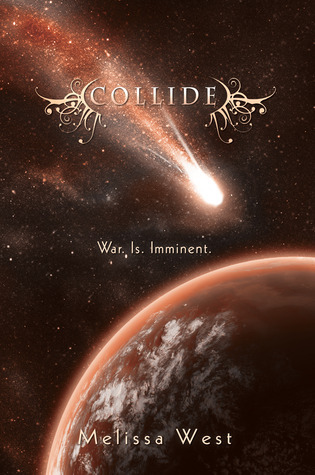 I cannot wait to read Collide! AHHH, Ensnared. So effing excited.